“How to Save Almost 100 Bucks on Philippines Pool Supplies” is today’s featured topic. Now for those of you that don’t have a swimming pool but still need chlorine, we’ve discovered a place where you can save some money on this item. That was all the information my asawa had received from our tipster, an employee at a local super market in Guimaras where my wife often shops. My spouse explained we needed it for our pool. We couldn’t make it over to Iloilo yet to purchase our chlorine which we buy in 45 kilo containers. The “tipster” turned out to be a former employee of G-DITH’S. I did a Google search for G-DITH’S in Iloilo City using the street name of DeLeon. My search turned up nothing. I then tried using the Google Map for the area and zoomed in. Still no G-DITH’S. So we headed out to the “Super,” or “Terminal” Market one morning in Iloilo not knowing where we exactly going. The “Super” is the absolute best and cheapest place to buy fruits and vegetables in the Iloilo area. I approached a trike driver figuring a trike driver would be my best bet to finding G-DITH’S. The driver knew the location and pointed. “Over there!” the Popular Catch Phrase for Directions in the Philippines. Whew! “Over there” is a phrase many Filipinos use when they’re giving you directions. My asawa uses it all the time whenever I ask her where something in the house is located. “And exactly where is ‘over there’” I invariably have to ask. My wife and I headed in the general direction where the trike driver pointed. We walked about a block on DeLeon and came to an intersection where we could go either left or right. It was the trike driver who I had asked directions from. 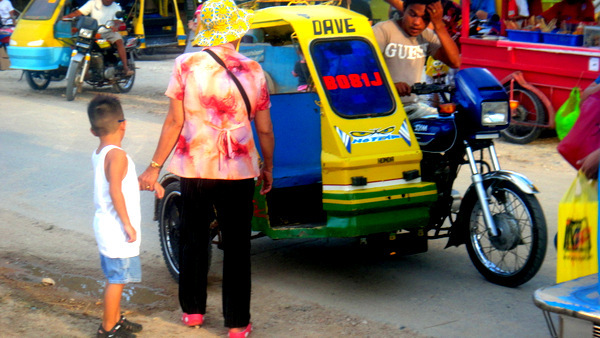 The back of the driver’s shirt revealed he was also the local barangay tanod, watchman. What a nice guy, I thought, and asked my wife to please give the man a tip. The tanod was happy to get the 20 peso note, 40¢, and gave us a big toothless smile and a wave as he drove away with his passenger. G-DITH’S was sandwiched in between a row of other small retail outlets as we approached the entrance. It was a typical open-air establishment. I asked a clerk if they carried chlorine. They did. “Let me check, sir” the employee politely informed me as he had to ask his boss who was busy with customers behind the check-out counter. Finally, after a few minutes, the boss was able to give the employee a price on the chlorine. Always the suspicious crusty old expat, I asked if I could verify that quote in a price book the employee carried with him. I had noticed that the worker had looked up the price while waiting for his supervisor to answer him. I verified the price the manager had called out. Now the price for one 40 kilo keg at G-DITH’S was first quoted to me at 2,650 pesos, 53 dollars. I asked the boss if she would give me a discount if we purchased two 40-kilo containers. She did. We paid 2,500 php per container for a savings of 300 pesos. Now six bucks might not sound like much but 300 pesos can buy my wife and I a couple of Big Breakfasts at McDonald’s. Hold the rice. Give me the toasted muffin with two packets of strawberry jam, please. 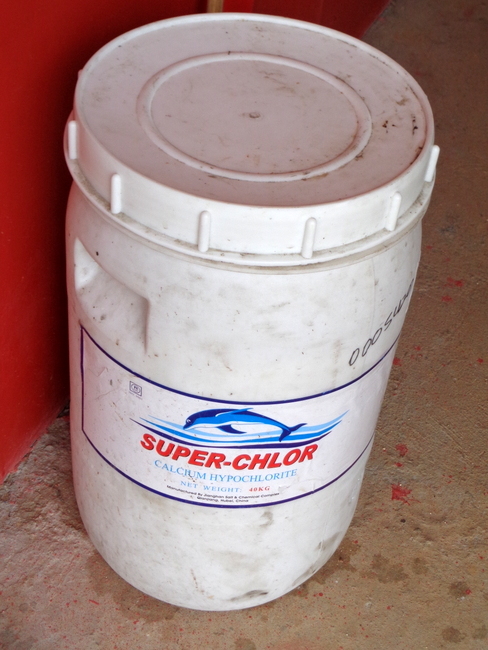 We used to purchase a 45-kilo drum of chlorine from a hardware store in Iloilo City for 5,500 pesos, 110 US Dollars. That’s about 122 pesos per kilo. At “G-DITH’S” we purchased two 40-kilo drums for 2,500 pesos each, 50 USD. That figures to 62.50 pesos per kilo, almost half-price. That’s a total of 80 kilos of chlorine, Calcium Hypochlorite, for 5,000 pesos, 100 US Dollars. Those same 80 kilos would have cost us 9,760 pesos, 195 USD, at the hardware store we used to buy it from. That’s almost a 100 bucks in savings. I was happier than a turd in a toilet bowl. Thanks to all the friendly folks at G-DITH’S. I wish the crusty old expat could tell you what else this outlet carried but I was only looking for items on my shopping list and didn’t pay attention. But next up, I’ll certainly check on that. I commend them for not jacking up the price on the chlorine and charging me the much-dreaded “Skin Tax” which is the practice of a few unscrupulous businesses we have encountered in the Philippines. We picked up our chlorine later as we had more shopping to do. Rest assured we made a stop at the “Super” and picked up some lettuce, potatoes, carrots and an assortment of other vegetables for our trip back home to Guimaras. In fact, many vendors in Iloilo City and Guimaras, our home province, shop at the “Super” and re-sell the produce they purchased at their own local businesses. 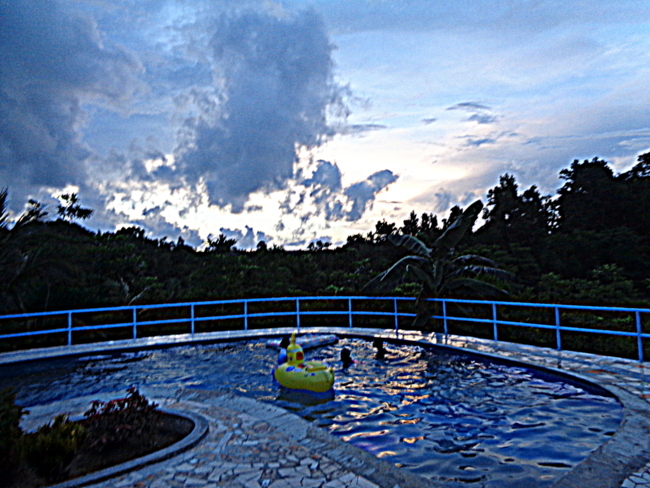 “How to Save Almost 100 Bucks on Philippines Pool Supplies.” Ain’t it great saving money!